Time to feature some more of our coaching stock and, this time, it is the Lima Chocolate and Cream Mk 1s. We have just the one of Full Brake and its Running Number is W24680. 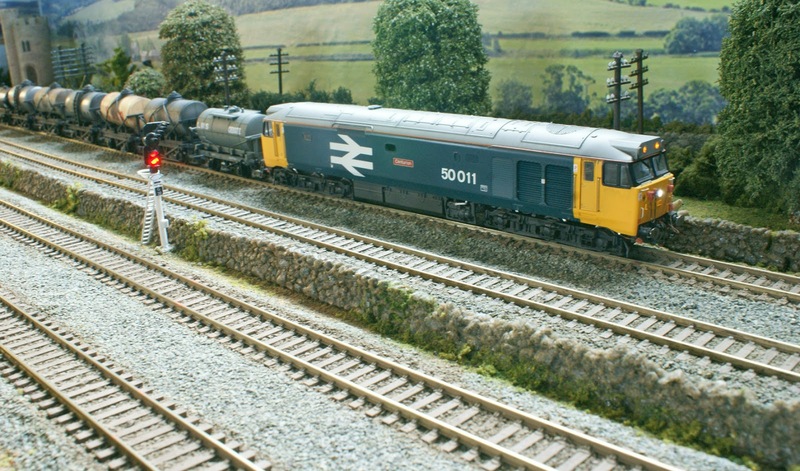 The Catalogue Number is L305345 and this model dates from around 1980. There are two Corridor Second Class coaches in our fleet, both with the Running Number W26070. This one has a Cambrian Coast Express coach board which has never been removed. The Catalogue Number is L305362 and it dates from 1982. We just have the one Restaurant Buffet car. Its Running Number is W24760, the Catalogue Number is L305322 and it dates from 1980. We have two of these Corridor Composite coaches, both with the Running Number W24624. The Catalogue Number is L305313 and they both date from 1979. We also have two of these Brake Second Class coaches. The Running Number is W24528, the Catalogue Number is L305333 and they both date from 1979. Finally, and with nothing whatsoever to do with the preceding coaches, here we see Class 50 - 50011 'Centurion' - heading north, in charge of a short rake of small oil tankers.